We aim to expedite the rescue process of Bernese Mountain Dogs by assessing an incoming dog, providing interim foster care when needed and then re-homing the dog with a new family that matches the dog’s needs. 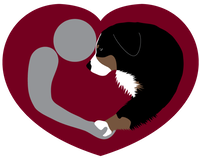 The two clubs are both non-profit organizations and the rescue and re-home services are provided by volunteers dedicated to the rescue of abandoned, neglected or unwanted Bernese Mountain Dogs. As the breed is gaining in popularity, so are the numbers of dogs in need of relocation. Dogs come to us in a variety of ways. We have found them in newspaper ads, shelters and abandoned at properties. We rely on a strong network of Berner enthusiasts, shelter volunteers and veterinarians for notification of any dogs in need. Please don’t hesitate to contact us should you hear of a Bernese Mountain Dog in need of a new home. In the event you or someone you know has a Bernese Mountain Dog that needs a new home due to unforeseen circumstances, please contact us at (510) 991-6376 for assistance with placing your pet in a loving and safe home. For additional information on our rescue and re-home services please read our Rescue FAQ or contact our Coordinator.